Just five months ago, money from the DCCC and other Left/Liberal interest groups flowed into Sussex County. It did its job and took out the most conservative Republican congressman in New Jersey -- Scott Garrett. Anyone who knows history knows that the Left isn't a straightforward opponent, but one that comes at you from within and without. One of the big coups of the Garrett-Gottheimer race was when the Left/Liberals got the Republican mayor of Sussex County's largest municipality to jump ship and endorse Democrat Gottheimer over Republican Garrett. Working from within the Republican Party, the Left/Liberals got 9,136 Republican base voters to reject Scott Garrett -- nearly 20 percent of his base vote. Then they split another 7,424 away in the General Election. That's 16,560 lost votes for Garrett, who ended up losing to Gottheimer by 14,897. And what did those Tea Partiers accomplish? They swapped a Sussex County conservative for a Clintonista liberal Democrat. Brilliant! During his career, Scott Garrett had a lifetime rating from the American Conservative Union of 99.38%. The next highest Republican in New Jersey has a rating of 69% and the lowest Republican 46%. The best New Jersey Democrat was 10.42% and the worst has 0%. Now there is a liberal Clinton Democrat were once there was Scott Garrett. Way to go Mark Quick, Michael Cino, Peter Vallorosi, Bill Hayden! Way to go! Last year, Sussex County was a bright spot for the Clinton Democrats. Last year the Left/Liberals got their way in Sussex County, so why not try for this year? And that is what's happening. No sooner did Assemblywoman Gail Phoebus call-off her primary challenge to Republican Senator Steve Oroho -- than the mask came off! 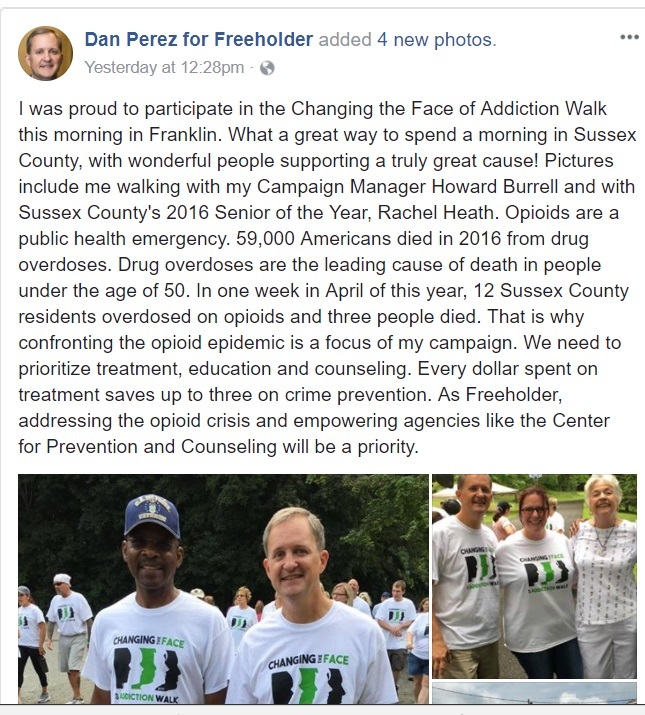 GOP-imposter Dan Perez -- Phoebus' political attorney and sometime consultant, the same guy who Freeholder George Graham appointed to the SCMUA board -- declared that he was again a Democrat and that he would be running for the Sussex County Freeholder Board. Money poured into the pockets of Sussex County Democrats from that Democrat candidate for Governor Phil Murphy, the former DNC finance chairman and Goldman Sachs rich guy who bought an ambassadorship and now (Jon Corzine NUMBER TWO?) wants to buy the Governor's office. The Democrats have a full-slate of legislative candidates for the first time in years and they are going to try to do to Steve Oroho, Parker Space, and Hal Wirths this year, what they did to Scott Garrett last year. That's the without part. But the Left/Liberals wouldn't be the Left/Liberals without the within part -- the Fifth Column. Before tearing off his GOP mask and revealing himself as the true Democrat he is, Dan Perez, George Graham, Bill Hayden, and others were all involved in the same effort trying to promote Gail Phoebus' candidacy. That was the cover. The real mission was to recruit "Tea Party" candidates to run in the Republican primary to "soften up" Oroho, Space, and Wirths for a Clinton Democrat take-down this November. They talked two candidates into running for the Assembly -- and when no one else would do it, one of their organizers (Bill Hayden) jumped into the Senate race on the same day that Perez announced that he was again a Democrat! The Democrats have their anchor for the 2017 Sussex County elections in the form of Dan Perez (SCMUA commissioner, courtesy of 3 GOP freeholders), their three legislative candidates, and their three GOP shills to do damage in the Republican primary. How can you tell someone is a shill? Many have never even voted before being recruited as a shill and then suddenly they show up, have a big mouth, and are assuming a "leadership role" in a group unknowingly being used to promote the shill (in this case, the Tea Party). Doubt us? Take a look at Bill Hayden's voting record. He hasn't bothered to vote since 2010. Another sign is a disdain for traditional conservative organizations like the National Rifle Association (NRA). Bill Hayden attacks the NRA on Facebook and craps on the group's leadership. Shills always do that because they aren't really conservative but they do have big egos. That is how the Left/Liberals recruit them, they play to their egos. A guy like Perez whispers into Hayden's ear that "you too can be a big man" but the reality is that Hayden is there simply to damage a conservative Republican enough in the primary so that Perez and company can elect a liberal Democrat in November. So groups like the Tea Party and their followers have a decision to make. Do they want to be active participants in making Phil Murphy's dream come true of total Democrat hegemony in heretofore Republican northwest New Jersey? Or do they want to defend traditional conservative Republican values? Why is a Tea Party group promoting liberal Democrats?